These Italian made Persian Turquoise cabochon 18kt 750 yellow gold earrings are exceptionally gorgeous and are extremely well made. These estate turquoise earrings feature smooth, evenly colored, bright blue Turquoise cabochons. 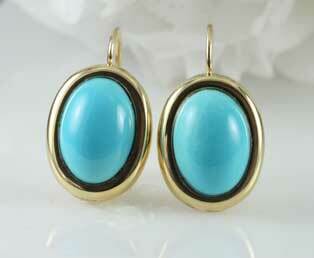 These Turquoise cabochons are gold backed and have pierced lever backs and dangle slightly below the ear. These Italian made estate turquoise earrings are crafted in 18kt 750 yellow gold.